The space at 75 Victoria St. has had a troubled history with brewing ventures. First it was the home of Denison’s Brewing Company, which had a decent run before closing in 2003 (and essentially becoming Side Launch). After that, Duggan’s Brewpub lasted only a few years before closing its doors in 2011. Some might also remember the building’s past incarnation as Beer Academy, a small batch beer bar that was operated by Creemore Springs and Granville Island (both owned by Molson) featuring beers from the two breweries as well as house-made beer from Six Pints, the name of Beer Academy’s project within the building. When the Beer Academy closed up shop at the end of 2014 with the promise of a new Creemore-owned venture in the future, there were quite a few who felt a substantial loss in (corporate affiliations aside) a venue with potential. 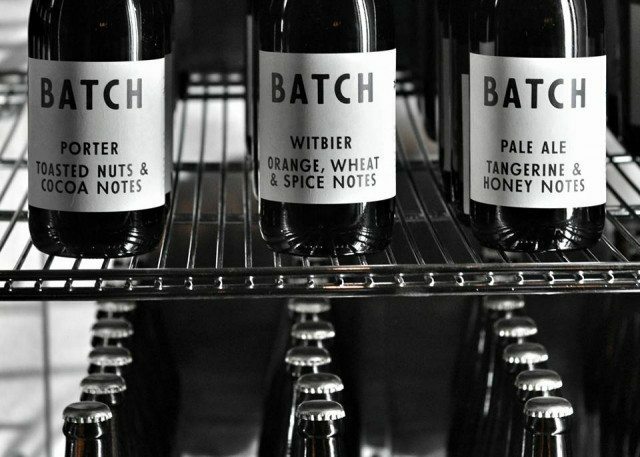 Now, the 2,300-square-metre space has been reborn as the Creemore project Batch. Officially opening on Mar. 7, Batch is a venue that advertises itself as an “urban gastrobrewery” (which is, let’s face it, a brewpub) with modern comfort food by Chef Ben Heaton, a substantial cocktail list, craft beer bottle selections from the likes of Side Launch and Left Field, and beers on tap that include Creemore’s own catalogue as well as special in-house beers made by head brewer Andrew Bartle (formerly of Northwinds Brewhouse and Eatery). The general feel of Batch is miles apart from its previous incarnations, going high-end-but-not, making it seem somewhat unsure as to what it wants to be. One half is a hip dining space, bottle shop, and coffee shop, with pies on special as well as local artisan mustard prominently displayed. The other has a very club-ish cocktail bar vibe to it. As for the beer, Andrew Bartle is a talented brewer and I’m not surprised to find that the beers match his abilities, bringing forth classic styles that are unafraid to show their flavours for both the newcomer and the veteran. The Pale Ale is citrus heavy in its hop character, with a distinctly dry, bitter finish. The IPA highlights the Citra and Mosaic hops well, with lots of tropical fruits and a generous helping of citrus and pine. The porter is an epic battle of cocoa and coffee, with the roasted notes finally taking the wheel and easing into a nice finish. The Witbier has the characteristic notes of banana and clove familiar to the style and makes for fairly easy drinking. Other beers included (though not ready yet) are the Irish Red Ale and Cream Ale. In the end, Batch will no doubt be a welcome spot for many downtown residents. The food menu seems promising, the beers brewed are in good hands, and the venue itself is spacious and hip. While it remains to be seen how they will do, this new direction may very well break the location’s curse and breathe fresh life into the building.